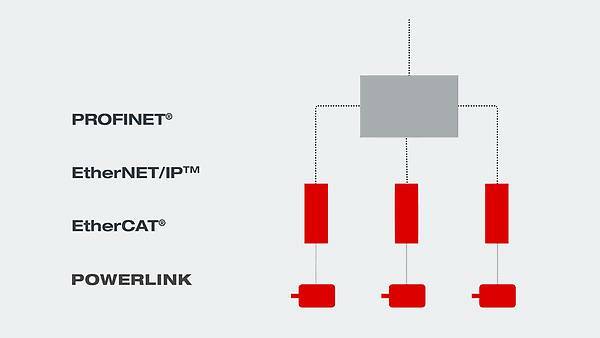 Industrial ETHERNET – for inverter technology made by SEW-EURODRIVE of course: you can build on the speed and reliability of these fieldbuses in centralized as well as decentralized installation topologies. The high transmission rate of Industrial ETHERNET is just one reason for the widespread use of this medium. Industrial ETHERNET ensures vertical data communication to the control level with high bandwidth as well as horizontal process data communication between the controller and the application, e.g. with drive or frequency inverters. Industrial ETHERNET: the communications link between actuators, sensors and control technology. The protocols of Industrial Ethernet differ in terms of the application protocols and real time properties. Industrial Ethernet also enables you to use IT technologies that everybody knows such as email for notification in the event of an error and Internet Explorer for diagnostics of the components used. It is also indispensable for achieving quick and efficient startups and for ensuring ongoing operation. Our comprehensive offering for process data communication within inverter technology complements this capability perfectly. Be sure to use the quick and safe communication with our inverter technology and fieldbus systems based on Industrial ETHERNET in your machines and systems. Our global network ensures that we are there wherever and whenever you need us. as Industrial ETHERNET can be used vertically and horizontally in your communication structures. Industrial ETHERNET delivers a consistent speed of 100 Mbit/s during data transfer, as well as for horizontal and vertical system integration. builds on the proven functional model of PROFIBUS® DP and simultaneously provides a transmission option for process data and parameters as well as IT functions. Like with PROFIBUS® DP, with PROFINET® IO the decentralized field units are connected to the controller using a unit description. Further information is available from the PNO. is widespread in the English-speaking world and is used in many industrial applications. However, manufacturers in Central Europe who export to these countries also use EtherNet/IP™. Further information is available from the ODVA. is a HART (real time) capable communication technology, which also proves to be flexible during installation. Star, tree and line topologies, all also with spur lines, can be implemented practically without impacting performance. Further information is available from the ETG.